Day 3: St. Joseph, MO to Sioux Falls, SD. Another day dawned sunny and warm on this journey to escape the heat of Georgia summer. It wasn't so much the 75° temperature as the 90% humidity that gave the day such a muggy feeling the moment we stepped outside. Under the canopy in front of the hotel, the number of motorcycles—mostly Harleys—had multiplied overnight. We finally learned from the desk clerk last night why we saw an unusually large concentration of bikes and motorcycle trailers yesterday. The legendary Sturgis Motorcycle Rally, one of the world’s largest such events, concluded in western South Dakota yesterday, and participants are on their way home. This little town of 6,883 hosts more than half a million motorcycle enthusiasts for a week each August. With 2015 marking the 75th anniversary of the rally, attendance projections breached one million. Though official counts have yet to be announced, every indication points to a record-breaking crowd. Since we entered southern Illinois, we have been driving through the heart of corn country. 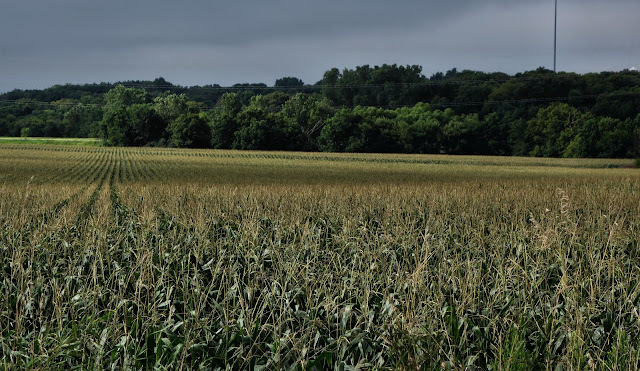 As we drove up I-29 into Iowa, both sides of the highway were lined with massive fields of corn. Shortly after we entered the state, we turned west and picked up NE-2 toward Lincoln. We took a brief detour on NE-67 to the tiny village of Dunbar (pop. 187) to mail some memory cards to family members about my grandfather, whose birthday is coming up this week. Since he was a lifelong resident of the even smaller hamlet of Dunbar, AL, it seemed fitting to seek out a Dunbar postmark. 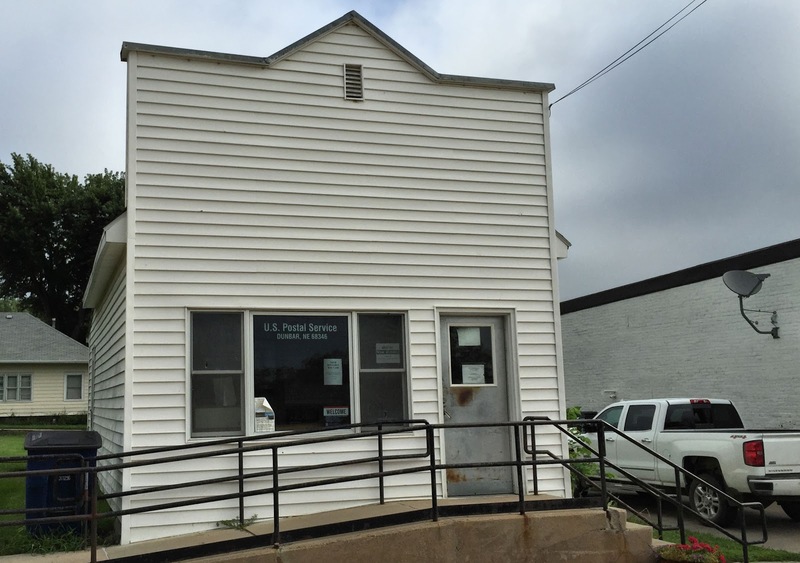 Once a thriving freighting depot in the 1880s, Dunbar, NE today has been reduced to one active business—a fabricator of custom workshop cabinetry—and a post office open from 1 to 3 p.m. The town hall/fire department building was locked up tight at 9:15 on this Monday morning. We arrived at the Nebraska State Capitol just before 10:30, easily locating free (and shady!) parking across the street. Not finding the usual prominent signs identifying the “Public Entrance,” we wandered into the south entrance on the main floor, startled by the empty corridor inside. Expecting a security guard to swoop down and intercept us at any moment, we crept warily into the building. 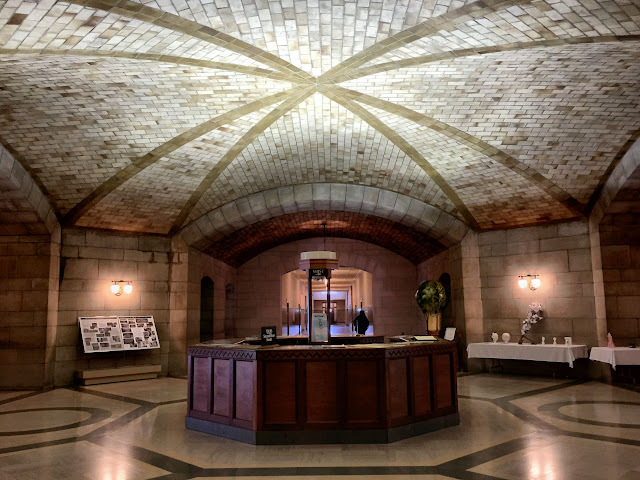 At the end of the hall, under a vaulted ceiling reminiscent of a medieval castle, we were warmly greeted by friendly Nebraska volunteers staffing the capitol information desk. It was here we got our first orientation to the “cross within a square” floor plan of the Nebraska statehouse. 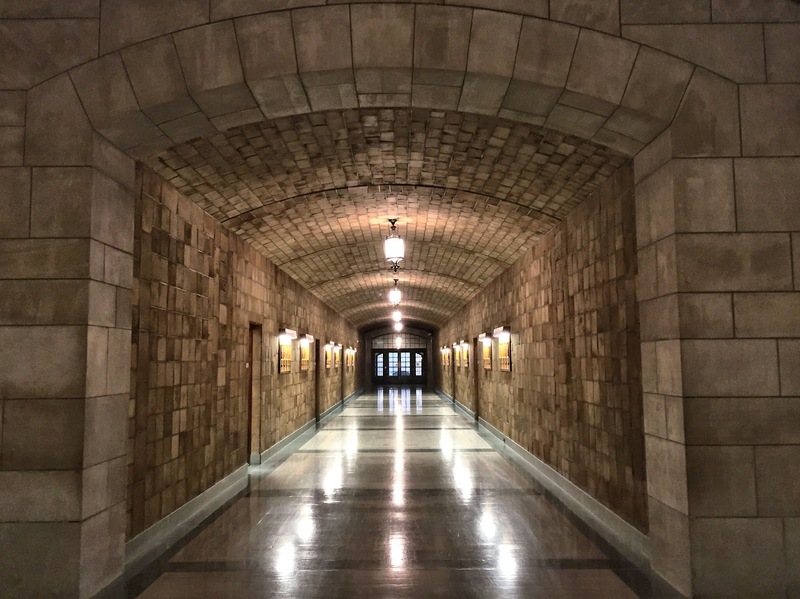 When the state announced an architectural competition in 1919 to replace its crumbling sandstone capitol, there was a strong emphasis on creating a statehouse that captured the spirit of Nebraska. Moreover, the design would need to accommodate the state’s “pay as you go” funding strategy, because the state constitution’s ban on debt and deficit spending would impose a ten-year construction period with $1 million budgeted per year from a special tax. 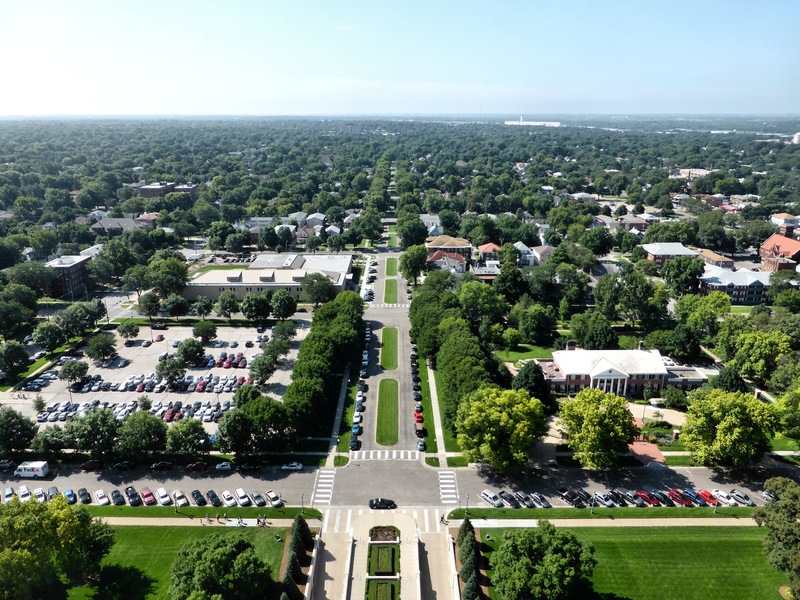 Celebrated New York architect Bertram Goodhue submitted the winning design—a broad base reflecting the wide expanse of Nebraska’s prairie centered by a tall tower as a landmark visible from miles away. The treatment brings to mind Chimney Rock, the state’s most prominent and well-known geological formation, which served as a landmark to early pioneers migrating westward. 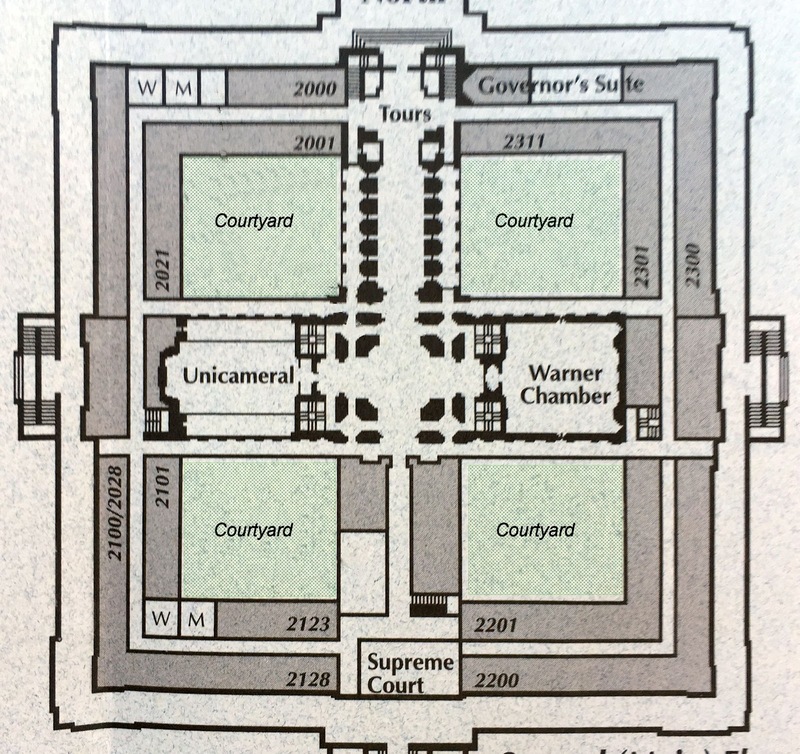 In the first phase of construction, the three-story outer square—a corridor with rooms on each side—was built around the perimeter of the existing capitol. After government offices were moved into this new construction, the old statehouse was demolished to make way for the “cross” and central tower, which were also built in phases. 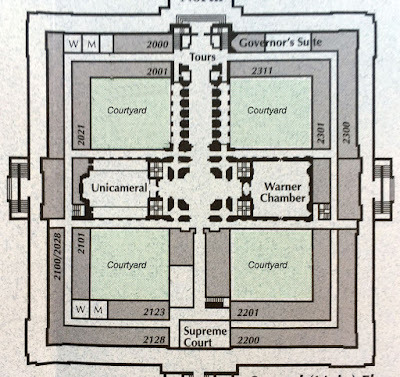 Four courtyards were tucked in between the corners of the square and the center of the cross, where the rotunda was located. 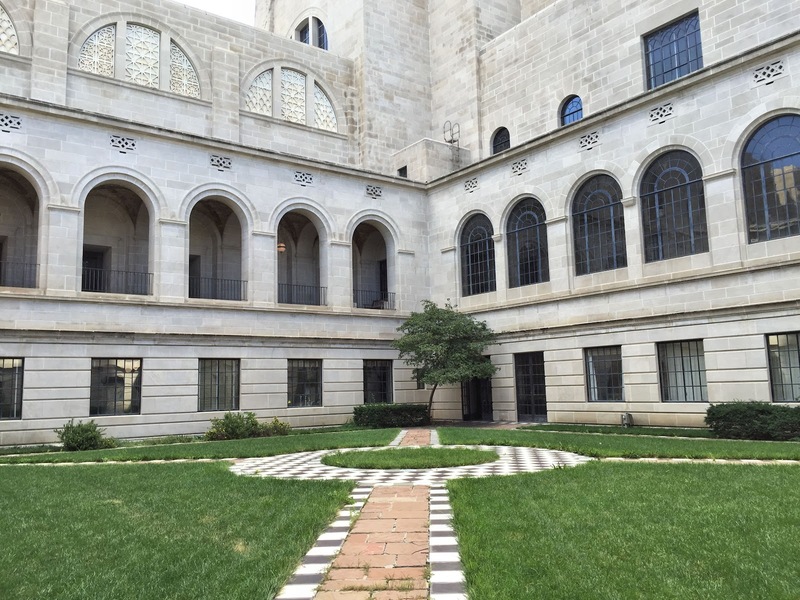 Only recently has the state budgeted funds to complete Goodhue’s concept for the courtyards. 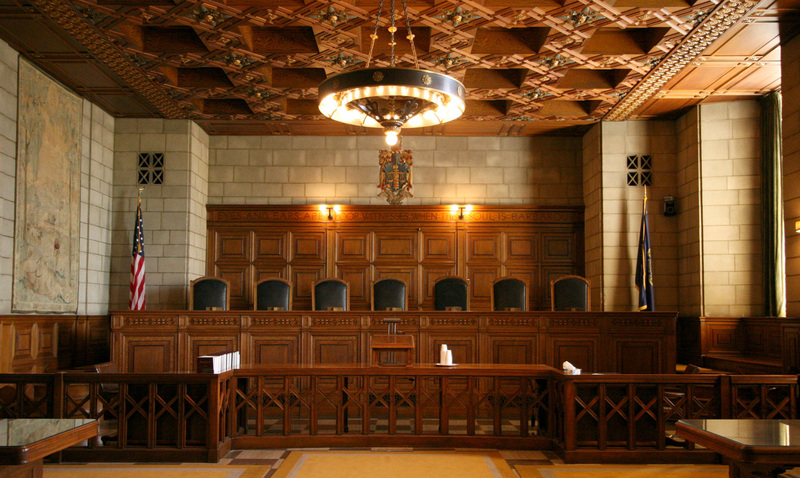 Renowned Nebraska architect Thomas Kimball, who guided the architectural competition process, insisted that a complete interior artistic treatment be integrated into the design plan. With this in mind, Goodhue engaged a sculptor, an artist talented in multiple mediums, and a Nebraska philosophy professor as thematic consultant. 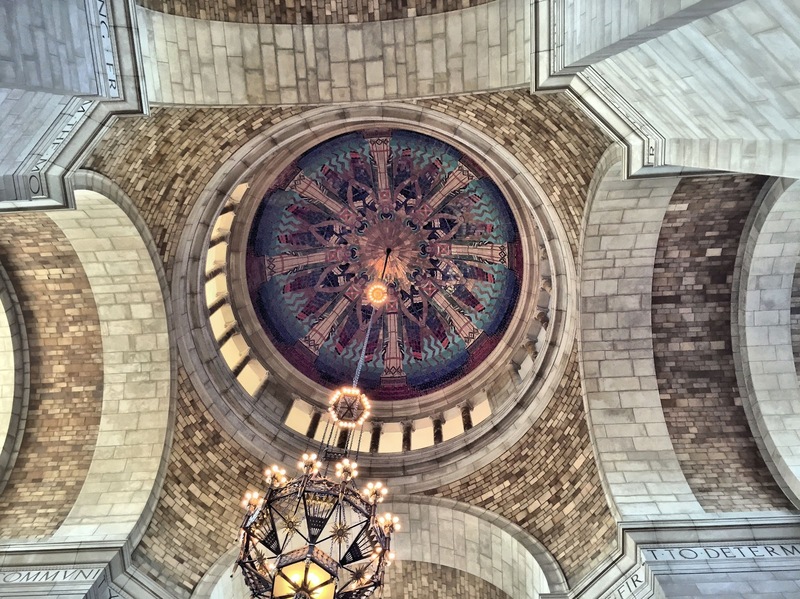 This team elevated the Nebraska capitol from just another beautiful building to a monumental space rich in meaning and symbolism reflecting Nebraska’s human and natural history. Floor and ceiling mosaics depict agricultural products and native animals. 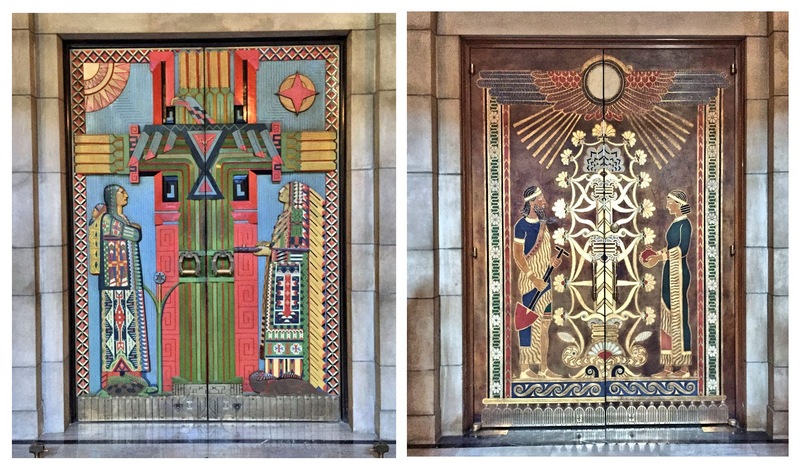 Murals relate the march of human history. Even the prehistoric life of Nebraska is included. 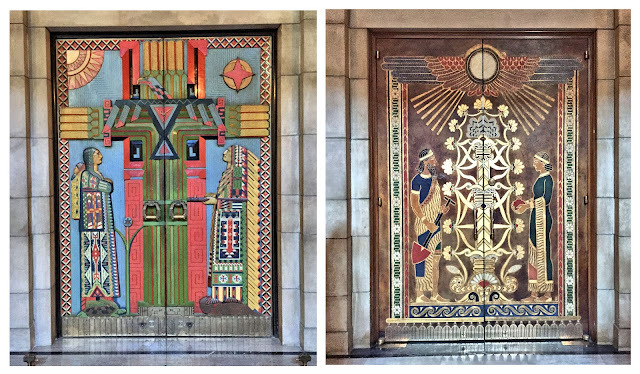 Native American influence is celebrated in carved mahogany doors to one of the two legislative chambers. Reflecting the wide array of cultures which have influenced western thought over time, a variety of architectural styles—from Byzantine to Italian Renaissance—have been harmoniously incorporated into the statehouse. 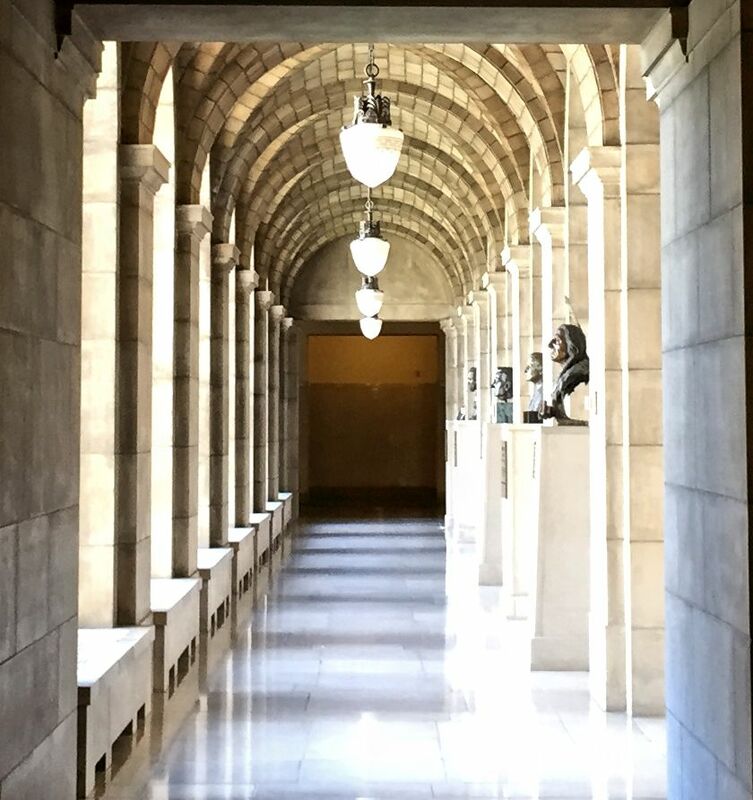 The Great Hall, Goodhue’s centerpiece that leads to the rotunda, evokes the majesty of a great cathedral—one whose marble columns are topped by capitals featuring bison heads and stalks of corn. Above the rotunda is a 110-ft. dome featuring a mosaic mural honoring human virtues. 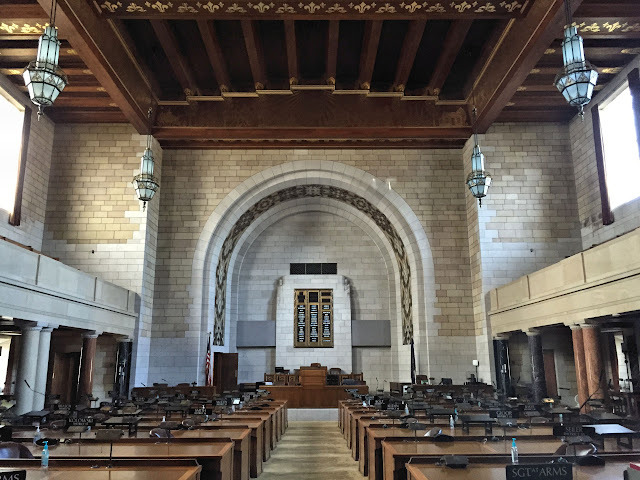 To streamline government operations and reduce costs, Nebraska voted to move to a unicameral legislature in 1937, the only one of its kind among U.S. states. The body comprises 49 members, called senators, who enact legislation in a chamber which honors the age of settlement on the plains. 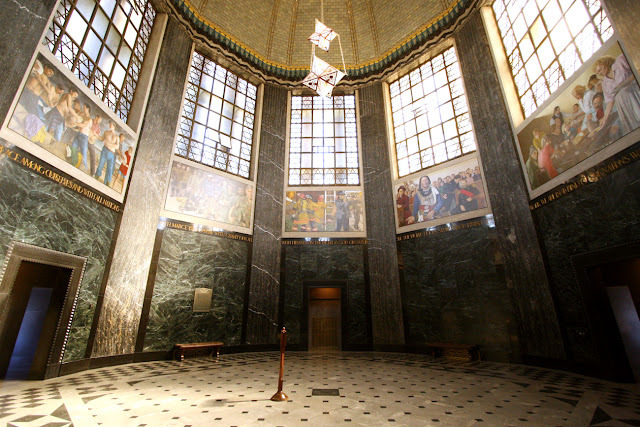 Multi-colored marble columns in the chamber symbolize the state’s ethnic diversity. Just below the capitol dome on the 14th floor, a series of murals in the Memorial Chamber honors the everyday heroes of Nebraska—military personnel, first responders, civil rights activists, relief workers, volunteers, and medical workers. 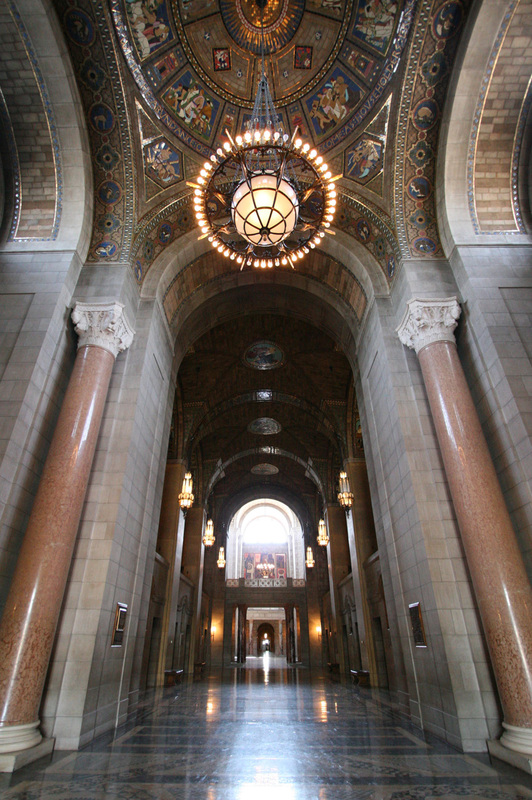 An exterior observation deck around the chamber’s perimeter offers expansive views of Lincoln and beyond. Unlike in some states whose tour offices are staffed by volunteers, Alex, our capitol guide, was part of the statehouse personnel. With her background in art history and her obvious appreciation for her state capitol, she was an excellent ambassador for Nebraska. 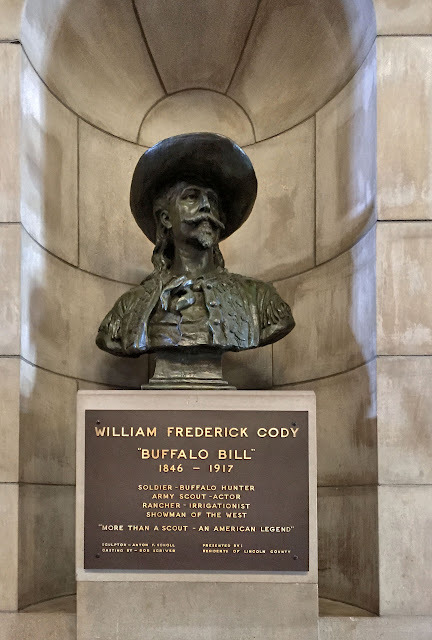 With a new appreciation for Nebraska and a more refined lens through which to view state capitol buildings, we turned back east from Lincoln and returned to I-29 north, stopping only briefly for a letterbox near Alvo and a couple of pit stops before arriving at Sioux Falls, SD, at 6:30. Tomorrow we’ll turn our car on an unwavering path north with the goal of making it through both the Dakotas and into Winnipeg, Manitoba. Walnut ceiling of the Supreme Court chamber includes tiny perforations to absorb sound. 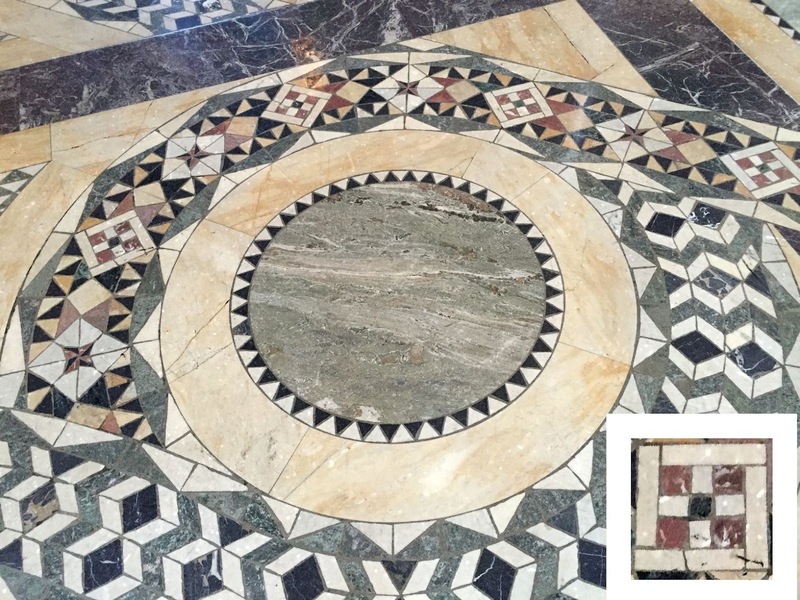 Mosaic floor in vestibule incorporates replica of floor plan (see inset).